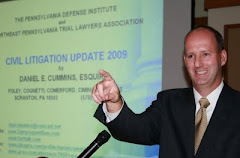 In two Orders handed down yesterday, July 6, 2010, Judge Edwin M. Kosik of the Federal Middle District Court denied pre-trial Motions filed by former Luzerne County judges Mark Ciavarella and Michael Conahan in the federal criminal case. The Order primarily affects Ciavarella since Conahan previously pled guilty. In his Order, Judge Kosik denied Ciavarella's motion for a change of venue as well as the motion for Judge Kosik's recusal, i.e. a request that Judge Kosik not handle the case. The Order also denies Ciavarella's efforts to keep the taped recordings of the former judge and his co-Defendants from the jury. Ciavarella awaits trial on the 48 criminal counts levied against him.